With temperatures dropping, our daydreams of hunkering down in a cabin for the next few months are getting more frequent. 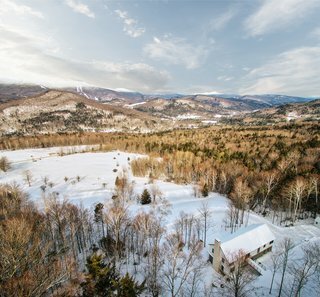 From Czechia to Canada and everywhere in between, here are the wintry abodes that made our editor's top picks this week. From the designer: "The Lac Brûlé House is located in a forest on 15 acres of land. ... [By] combining wood and aluminum, these clean, rectilinear volumes create spaces that intersect, letting light into the sky and giving a view of the forest at all times." 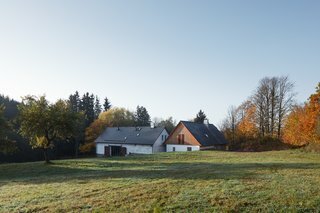 From the photographer/concept studio: "In this project we were searching answers by means of respect to the original building logic and traditional construction techniques. Our aim was to attain a natural feel instead of a perfect formal imitation. Natural and handcrafted materials like wood, stone and soil bring in an innate imperfection that becomes the main aspect of the project, considered since the beginning of the design process." From the architect: "Wee Ski Chalet represents a shift in one family’s vision for a place to call home after a day skiing on the mountain. 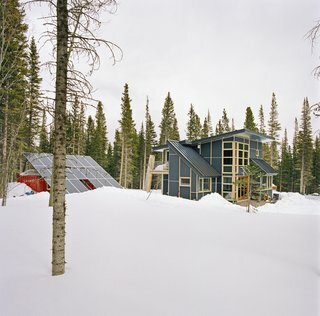 Embedded in a Colorado ski resort and accessible only via snowmobile during the winter season, the cabin rejects the more prevalent ostentatious visual language seen in oversized and under designed mountain lodges." 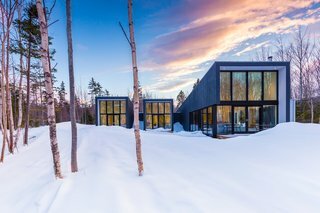 From the architect: "This Cape Breton prefab retreat is nestled in a hardwood forest along the shores of the Bras D’or Lake. 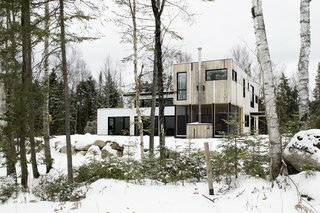 The mandate for this project was to create a simple dwelling with a clear separation between the public and private realms while respecting the natural environment." From the architect: "Tall windows are strategically placed around interior spaces to provide optimal views out towards the mountain ranges in the distance and provide natural light to key living areas. The house also allows for strong ties to its surrounding landscapes with a bridge that connects its users to a network of paths leading up through the mountains."